MONROE, WI – Monroe Arts Center (MAC) opens the 2017-2018 entertainment season on Sunday, September 17 at 2:00 pm with a concert by The Hunt Quartet. This is the first of three Sunday classical concerts to be presented this season in MAC's Gunderson Stiles Concert Hall, 1315 11th Street, Monroe, Wisconsin. The Hunt Quartet is comprised of outstanding graduate music students at the University of Wisconsin-Madison. The concert, with pieces by Joseph Haydn, Joaquín Turina, Sergei Prokofiev, and Anton Webern, features the breathtakingly beautiful sound of violins, viola, and cello played by Hunt Quartet members Chang-En Lu (Taiwan), Vinicius Sant'Ana (Brazil), Blakeley Menghini (Illinois), and Kyle Price (Ohio). 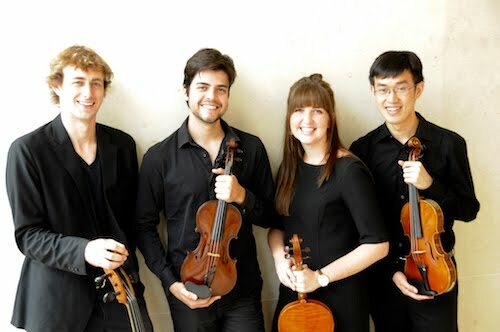 The Hunt Quartet represents a partnership between the Madison Symphony Orchestra and the University of Wisconsin-Madison Mead Witter School of Music. Through the Madison Symphony Orchestra's "Up Close & Musical" program, the Quartet makes regular visits to Dane County elementary schools, introducing Kindergarten through 3rd grade students to the basic elements of music. The Hunt Quartet also prepares multiple performances per year for the Mead Witter School of Music. Each of the four Hunt Quartet members are privately instructed by David Perry, Soh-Hyun Park Altino, Sally Chisholm, and Uri Vardi. Professor Vardi and Professor Altino serve as the group's primary mentors. The Quartet has recently earned opportunities to play in masterclasses with distinguished performers and educators, including violist Nobuko Imai (2015), the St. Lawrence Quartet (2016), and violinist Laurie Smukler (2016). General admission tickets are $10 for adults, and $5 for students 18 years of age and younger. Monroe Arts Center members may attend this concert for free. Tickets may be purchased by calling the Monroe Arts Center at 608-325-5700 or 888-596-1249, or in person at the box office located at 1315 11th Street, or online at www.monroeartscenter. The Sunday Concert Series is supported by Corporate Underwriter Colony Brands, Inc., and Media Underwriter Big Radio. Additional support provided by David and Julie Buchanan, Pete Guenther & Barb Woodriff, Lee & Chris Knuteson, Gof & Mary Thomson, Hans & Bobbie Bernet, David & Janeen Babler, Audrey Hein, and in part, the Gunderson Stiles Fund for Classical Music. On Sunday, September 17 at 2:00 pm, Monroe Arts Center opens the Sunday Concert Series with Madison's Hunt Quartet, featuring the music of Joseph Haydn, Joaquín Turina, Sergei Prokofiev, and Anton Webern. General admission seat tickets are $10 for adults, and $5 for students (18 & under) and are available through the Monroe Arts Center box office located at 1315 11th Street in Monroe, by calling 608-325-5700 or 888-596-1249, or ordered online at www.monroeartscenter.com.